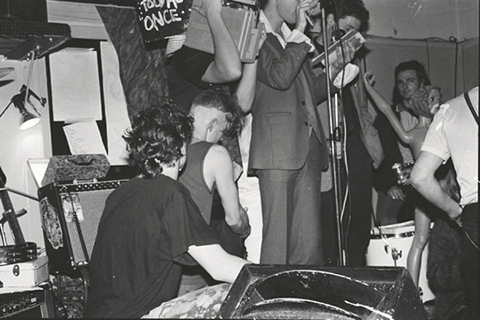 In the late 1980’s Scratch My Nose (SMN) performed a number of improvised sound and performance where different elements were bought together with mixed results. With no rules and no formal training in sound and performance, SMN’s unique approach and application of the experimental aesthetic that any sound, intended or not, is musical opened up new avenues. They also saw the importance of the relationship between performer and audience. This was not to be blurred, it was to be obliterated and the first instance of this was the openness of SMN to any person joining them, whether or not they had had any formal music or performance training. Performances were played out in unusual spaces and at times in public spaces: Sydney Harbour Ferries, Town Hall auditoriums, beaches, photographic darkrooms and rock music venues. 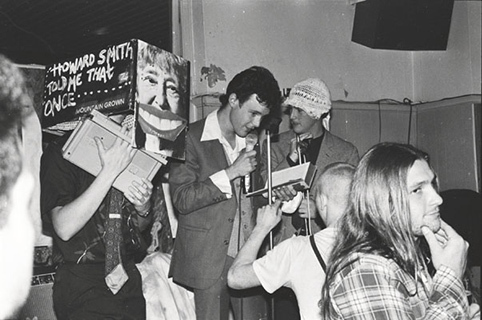 Their chaotic performance approach used a concoction of sounds including that of sped up tape recorders, high pitched balloon noises, car horns, high pitched voices and hyperactive laughter played in conjunction with the reading of selected cut-up texts from Burroughs and Plato. The SMN soundtrack played alongside a confrontational performance approach which saw audience members being approached individually or collectively. This was demonstrated in one of SMN’s earliest performances which were held as a series in a small confined space with room for only ten people. In one of these short performances one member of the audience was grabbed on the nose repeatedly while being asked to scratch his nose as the other members of SMN provocatively slam danced against the seated audience. This same approach was also taken against an entire audience when SMN ran through a crowd unannounced at a large music concert with a stack of fifteen shopping trolleys, loud motorbike engine attached and horns blowing, which saw the crowd part like the Red Sea did for Moses and his followers. Andrew Davies who studied with members of SMN was asked to contribute to these early performances. 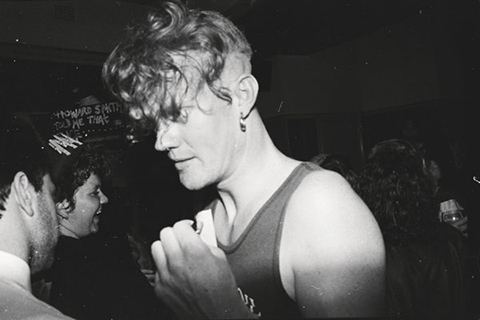 Andrew had wisdom beyond his years and was one of the first people to encourage SMN’s anarchic approach not to conform to the 'gatekeepers of culture'. Also Davies’ ideas were ‘sharpened’ by his friendship with anarchic Australian composer David Ahern (RIP) who had worked with Cornelius Cardrew, John Cage and Stockhausen, and had a lasting influence on SMN work. Ahern even witnessed a number of these early SMN performances before his passing in 1988. Many of SMN’s ideas, even if they weren’t familiar with them at the time, matched much of Ahern’s approach to performance and sound. 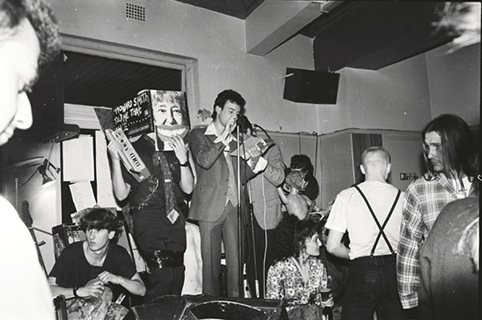 For example in Ahern’s own ‘Ned Kelly’, where he had asked the members of the Sydney Symphony Orchestra to fold paper aeroplanes and throw them around as part of the performance. This approach was often used by SMN to play on an audience’s expectations. Davies performed in many of SMN’s earlier performances and videos playing the role of a MC and the straight guy. He also wrote a book called ‘Zing Baba Zing’ which is co-illustrated with SMN, a children’s book with an adult sub-text. 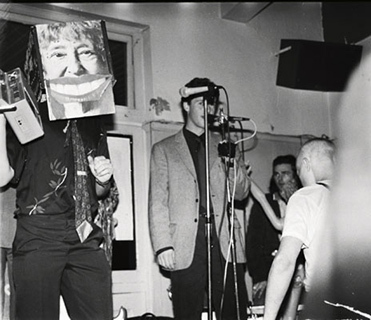 In 1987 I entered Sydney College of the Arts, wondering if there was any spirit of anarchy left in our generation. 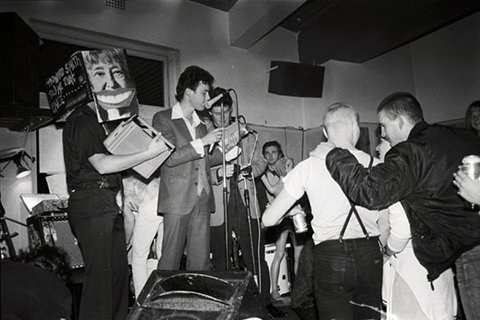 In the early '80s the punk revolution had blossomed in Australia, but by the time I entered art school in Sydney it seemed this had dissipated with career minded artists and designers. Then behold suddenly there appears Scratch My Nose in my very classroom, where this student gives a class speech in Swedish. Either this student is completely talented or insane. The former was immediately obvious and the latter description would depend on one's own view of reality. The only rule with Scratch My Nose was there were no rules. 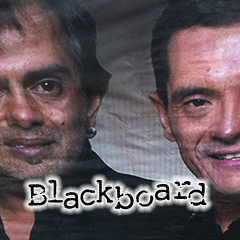 We were free to produce anything: performance, non-performance, book, video, random happenings. I remember several live performances though not the order in which they occurred. At one non-performance at the Paddington Town Hall I went round with other members of Scratch My Nose from table to table asking a questionnaire and fell upon unsuspecting audience. The first question was "Are you aware Scratch My Nose is performing tonight? ", then “Do Stone age Barbarians Sniff Up Dogs?”, “Does Jon English speak better French or does Dawn French speak better English?” and so on until the final question - "Will you buy me a drink?" This final question, plus the free entry for (non) performers made for a very cheap night. One Scratch My Nose performer did the ultimate non-performance performance by not showing up. Another event was on a cruise on Sydney Harbour. I was reading from Plato's ‘Apology’ to anyone interested, when fellow Nosers pressed me to start a performance. I did the usual theatrical emcee introduction but they refused to come out. Hurrying backstage they reminded me there is no start or conclusion to a performance it should just build spontaneously. What to do? I had already mustered an audience. So I went back on and gave a quick summary of Plato's position before returning to the reading. By this time Scratch My Nose had infiltrated the audience and was making mayhem in their own way. 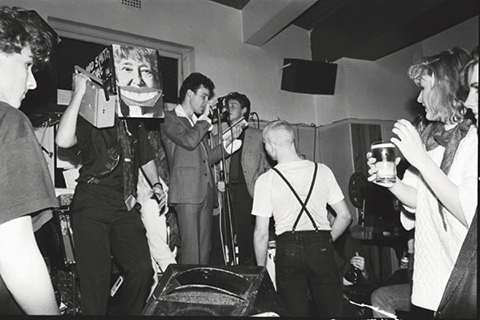 I had forgotten about the performance at the Palace Hotel in Darlinghurst until I recently saw the photographs. Here at last I met a fourth Scratch My Nose member who had been recruited on the strength of his crazy giggle. In 1988 this venue was notoriously known as a punk and skinhead venue (probably with innocuous band names such as Class War or Plunder and Pillage playing every weekend). 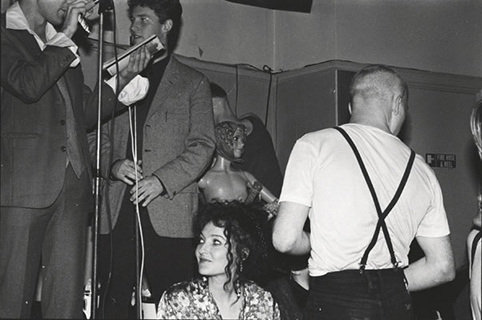 In the audience that night was a number of skinheads looking for an argument or more. I guess we supplied them an opportunity to put forward their right-wing views. In the photo’s I look a little unsure while reading Oscar Wilde. But I am (un)happy to engage their views. Or was I deliberately being indecipherable or is it just poor microphone technique? Next to me is the man with a box on his head playing sped up versions of Scratch My Nose songs on an old 70’s tape recorder while the giggling one looks very sheepish. In the audience is a number of Scratch My Nose members, gaffa taping the audience to each other including the skinheads and to us on stage while peers of ours joined us on stage producing a sonically deafening droning bass and drum sound to accompany the readings, laughter, sped up sounds and the audience interaction. The performance was built out of a basic skeleton idea and the looseness really allowed for all of the elements to be brought to the fore. I later wrote a story called ‘Zing Baba Zing’ which was co-illustrated by Scratch My Nose. I also participated in a Censorship is Torture video. The last performance I saw was sometime after graduation. I arrived a few minutes after the scheduled starting time at the railway station and already the performance had been stopped after a public complaint. 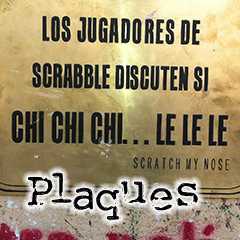 Now that Scratch My Nose is now a world-wide phenomenon let's hope there will be the long-awaited acceptance of this purest of art forms.